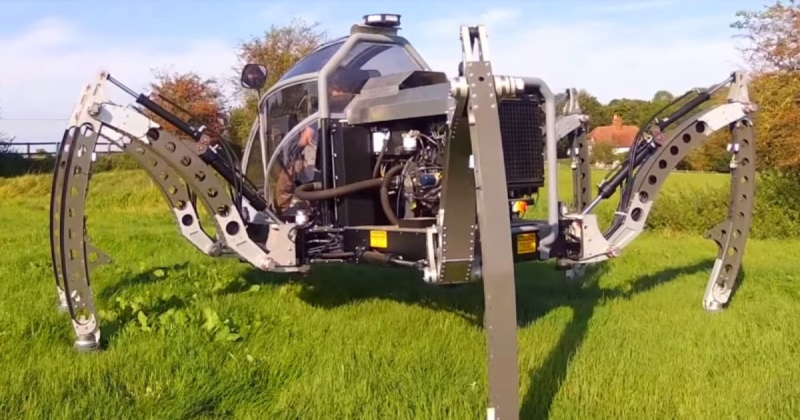 Mantis – A 2.2-litre Turbo Diesel-Powered Hexapod Walking Machine/Robot Is Really Amazing. The technology is making us amazed time to time. This giant Mantis, the spider robot is a large, robotic spider created by Matt Denton and his company Micromagic Systems. The spider robot took four years to create and design it. It can transport one person easily and can circulate on any surface. This 2.2-litre Turbo Diesel-powered, British-designed and -built walking machine can be piloted remotely because it is WiFi-sensor. This machine stands 2.8 meters high with a five meter working envelope and weighing in at just under two tonnes. Here in this video you can see, the robotic spider is walking with a man in it. The robot is controlled by a computer running the Linux operating system and HexEngine software, which controls the hydraulic solenoid in the legs. It is driver-operated by joysticks within a cockpit, can travel at approximately 1 mile per hour. The robot looks like a character of the sci-fi film.